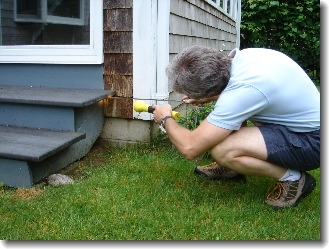 The inspection of the exterior includes, type of wall coverings, flashings and trim, all exterior doors and windows. Attached decks, balconies, stoops and steps, porches, and assiciated railing and support systems. The eaves, soffits, and fascia trim where acessible from the ground level. Vegigation, grading and surface drainage, retaining walls on the property when any of thses are likely to adversly affect the building. Also included are walkways, patios and driveways leading to the dwelling entrance. The inspection does not include geological conditions, fences outbuildings, seawalls and docks, or erosion control.